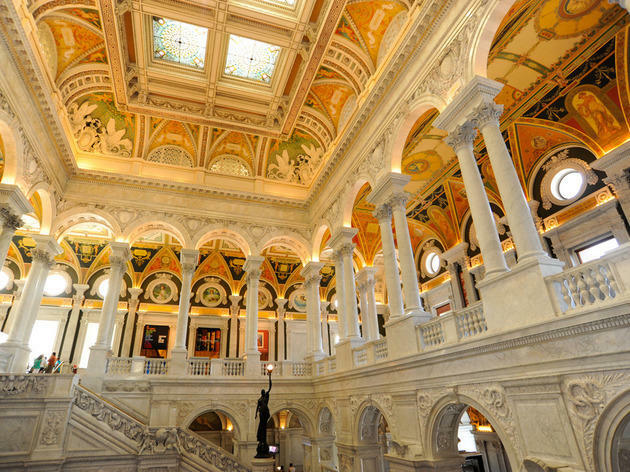 The national library of the US, the Library of Congress is the world’s largest. Its three buildings hold some 100 million items—including the papers of 23 US presidents—along 535 miles of bookshelves. Contrary to popular notion, the library does not have a copy of every book ever printed, but its heaving shelves are still spectacular. To get to grips with the place, it’s best to start with the 20-minute film in the ground-floor visitors’ center, excerpted from a TV documentary, which provides a clear picture of the place’s scope and size. An even better option is to join a guided tour. The original library was crammed into the Capitol. Ransacked by the British in 1814, it revived when president-scholar Thomas Jefferson offered his collection of 6,487 books. 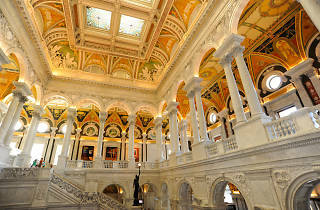 The Thomas Jefferson Building—the main one—was finished in 1897 and splendidly restored upon its centennial. Based on the Paris Opera House, the Library has granite walls supporting an octagonal dome, which rises to 160ft above the impressive Main Reading Room. Gloriously gaudy mosaics, frescos and statues overwhelm the visitor with a gush of 19th-century high culture. The Main Reading Room has classical marble archways and great plaster figures of disciplines (Philosophy, Religion, Art, History—all women) flanked by bronze images of their mortal instruments (Plato, Moses, Homer, Shakespeare—all men). The library hosts several long-term exhibitions, all with an interactive focus. Hope for America: Performers, Politics and Pop Culture draws on papers, jokes, films and TV programs from comedian Bob Hope, and examines the careers of Hope and other entertainers who chose to involve themselves with the political issues of their day. Exploring the Early Americas uses material from the Jay I. Kislak collection to look at indigenous cultures and the consequences of contact with European settlers. Also on display are the library’s collection of Bibles and Thomas Jefferson’s collection of books and manuscripts. The James Madison Building, opened in 1980, encloses an area greater than 35 football fields. It houses the copyright office, manuscript room, film and TV viewing rooms and the incredible photography collections. Diagonally opposite is the 1939 John Adams Building, which contains the Science and Business reading rooms. Anyone with photo ID can obtain a research card within about ten minutes. You can’t wander all the shelves yourself: a librarian will dig out your selected text. The library catalogue is also available online at www.lcweb.loc.gov, though many of the old card-catalogue entries are found only in their original drawers.